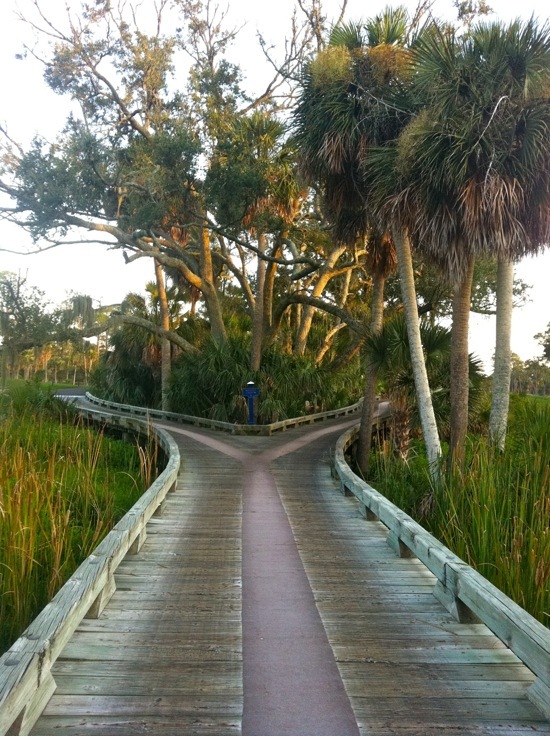 Fripp Island is one of the remote beaches off of the coast of South Carolina that you have probably never heard of. The island is a private residential resort community with very few amenities that just happens to have a couple of world-class golf courses located on the 6.5 sq mile island. The island is a private, gated community and is located about half way between Charleston, South Carolina and Savannah, Georgia. I spent seven beautiful days on the island and was able to get in quite a few rounds of golf during my stay. 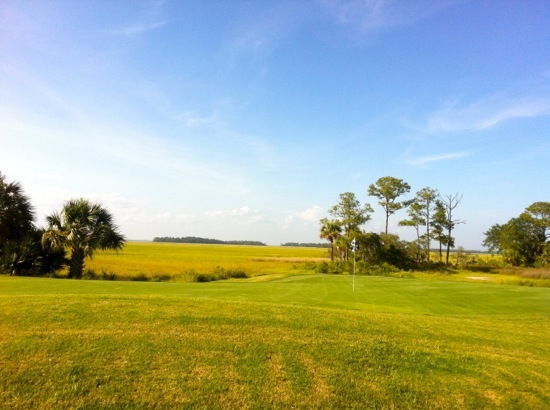 If you’re looking for a remote location to enjoy the beach and some serenity with some great golf – Fripp is worth considering. Fripp gets bonus point in my book with the primary mode of transportation on the island being golf carts – they seem to outnumber the cars 30-to-1. There are two golf courses on the island, Ocean Point (designed by George Cobb) and Ocean Creek (Davis Love III’s first signature course). The courses are both beautifully designed and maintained courses. The Golf Digest ratings for each of the courses are 4 stars (for Ocean Point) and 4.5 stars (for Ocean Creek). Both of the courses require an amenities card (which require staying at the resort) or to accompany a member of the clubs. Both of the courses are easily walkable but have equal prices for walking and riding. I ended up playing Ocean Point once and Ocean Creek three times during my stay. 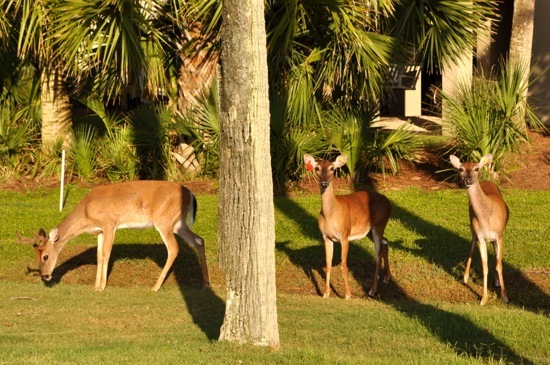 Both courses offer stunning scenery and abundant wildlife (deer, herons, and alligators) on many holes. I preferred the Ocean Creek course since it was only a few steps from our rental house and I really liked the layout and design of the course. While Ocean Point was beautiful and challenging (72.4/132 at 6,590 yards from the tips), Ocean Creek really won my preference with more interesting holes and high percentage of great holes (72/132 at 6,643 yards from the tips). Both courses are lightly played and extremely kid-friendly with wee-tees (playable after 3pm) and kid-friendly rates ($10 with accompanying adult). I’d estimate that after 3pm it’s likely that 80% of the groups included at least one young child in the party. The prices for the courses (for an amenity-card holder) run around $100 before 2pm and $65 or $55 for twilight rates. 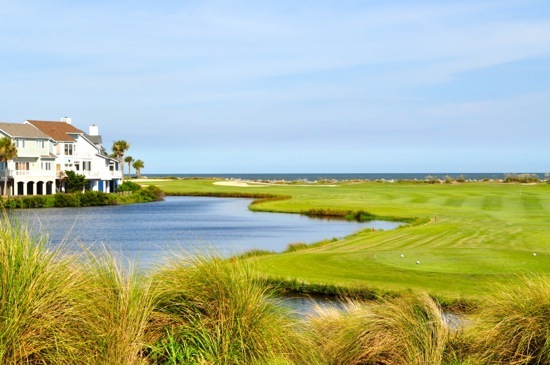 Both of these courses are well-worth the greens fees and if you make the trip to Fripp Island – I would bet that you end up playing almost every day of your vacation. I only played Ocean Point once during my stay – but I’m glad I did. Ocean Point was the first course on the island and was built in 1964. The things that stood out on the course were the beautiful ocean views, small greens, and abundance of water throughout the majority of the course. The first hole sets the pace for the course with water on the left and right of the fairway and also guarding the majority of the green. As you play through the course, it’s apparent that water and wind come into play on almost every hole. You play through the first six holes with heavily guarded greens and a variety of shots that demand accuracy as you approach the greens. Number nine ends the front nine with a stunning dogleg left with water guarding the left of the fairway and with the ocean on the right. The course ends with a short par 5 for number 18 that provides a subtle ending hole and gives the opportunity to end the round on a good note. I’m a fan of Davis Love III designs and the Ocean Creek course at Fripp Island is no exception. The layout is beautiful and almost every hole is noticeably well-designed. This course ranks among the best courses I’ve played in both architecture and grooming. The Ocean Creek grounds crew has done a stellar job in providing and extremely well-manicured course that is the best manicured course that I remember playing in a very long time. I was amazed hole-after-hole at the stunning job that the grounds crew has done in keeping this course well-manicured and in excellent condition. Almost every night of my vacation I walked out of the front door of the house we rented to admire the course. The course has wonderful greens, marsh views, and excellent precision in the execution of the architecture of this course. It’s also worth noting that I was extremely impressed even with the greens recently being aerated. Although the first hole lacks any significant scenery – hole two starts out setting the pace for the difficulty and beauty of the course. I noticed myself noting “that’s my favorite hole” hole-after-hole from hole two through hole nine. Each successive hole unfolds more and more beauty on the front nine, while providing a challenging-yet-playable layout that leaves you hoping that you’ll make it back to play the course again. The most memorable holes for me on the front nine are holes 4, 5, 6, and 7. 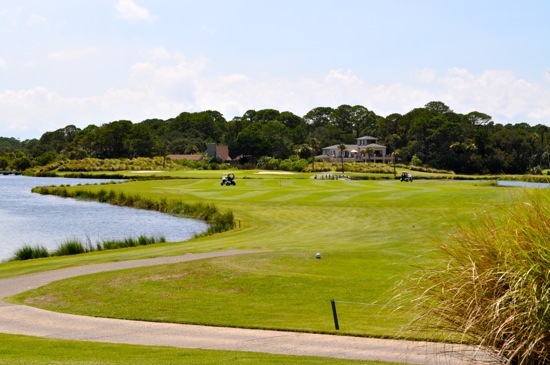 The back nine of the Ocean Creek course are still great holes – but they do find a hard time competing with the front nine. The back nine seems to play a bit easier while still requiring you to avoid a few strategically-placed hazards on each hole. 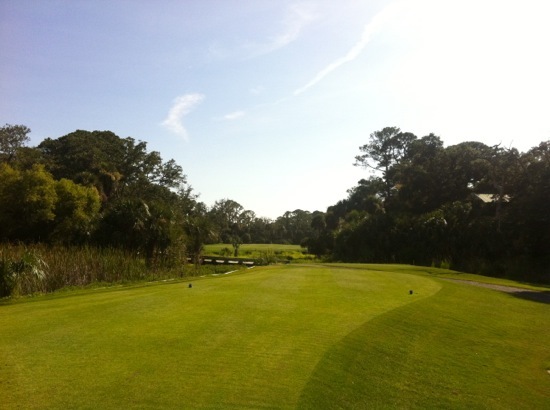 The 17th hole is a stunning hole ending with beautiful marsh views and with rolling mounds in the fairways throughout. Number 17, although I’m not sure why, was my favorite hole of this course and I found myself looking forward to it in each round that I played. The last hole is an excellent par 5 with a wonderful split fairway and blind approach about half-way through the hole. My vacation on Fripp Island was simply wonderful. The island provided some much-needed serenity and the golf was simply amazing and exceeded my expectations. I’ll be going back to Fripp Island soon and I’m sure I’ll be looking forward to the trip and revisiting some of my favorite golf holes to date. f you’d like to see some additional pictures of the Ocean Point and Ocean Creek courses, you can checkout the Ocean Point photo album and Ocean Creek photo album that we have posted on Facebook.